Fulton Hogan have blocked the new eastbound cycle lane on Waterloo Rd between Pound Rd & Islington Ave with a “No Right Turn” roadworks sign. Not sure why it wasn’t placed on the chipped bark landscaping on the other side of the shared use path, or moved 10m closer to the Islington Ave intersection and placed on the muddy berm (where until the end of last week Fulton Hogan had placed a gated Temporary Speed Limit sign). With the pedestrian refuge island in the middle of the road here, there is not enough space for a cyclist and a car to safely get past the “No Right Turn” sign (and definitely no space for a cyclist and one of the many trucks driving along here!). 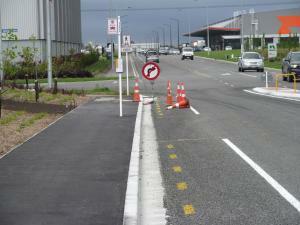 Sign has been moved from cycle lane onto shared path (leaving enough room to safely pass by).